Ilyasah Shabazz, third daughter of Malcolm X, is an activist, producer, motivational speaker, and author of the critically acclaimed Growing Up X and the picture book Malcolm Little: The Boy Who Grew Up to Become Malcolm X. She lives in Westchester County, New York. Shabazz and Magoon expertly guide the reader by presenting loaded scene after loaded scene.... The result is a satisfying (and appropriate) complexity. A completely absorbing novel... Readers for whom pre-civil rights America is ancient history will find this poetic interpretation eye-opening and riveting. 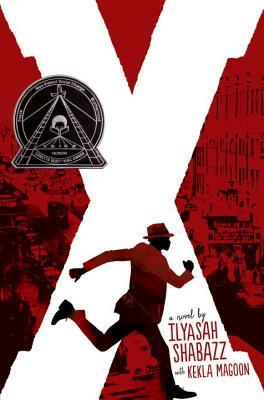 This fictionalized account of the boy who became Malcolm X maintains a suspenseful, poetic grip as it shifts among moments in his life between the years 1930 and 1948. ... A compelling coming-of-age story. An eye-opening look at an important historical figure. The author’s honesty about his early troubles serves to convey that it is possible to rise through adversity to make a positive difference in this world. A worthwhile addition to any collection. Although this is a work of fiction, it's strongly tethered to the facts, to the people and events that contributed to Malcolm's world view and his path to becoming a leader. Malcolm's voice is often funny, always perceptive, and as appreciative of beauty as he is critical of the disparity between the rights of whites and blacks. Riveting. ... Vivid. ... Malcolm's voice is often funny, always perceptive, and as appreciative of beauty as he is critical of the disparity between the rights of whites and blacks. This skillfully rendered novel traces Malcolm X's life through flashbacks, from his father's death to his imprisonment and eventual understanding of his father’s wisdom.... The publication of this book marks the 50th anniversary of Malcolm X’s assassination (February 21) and is a worthy tribute to the man. Shabazz and Magoon do a remarkable job generating atmosphere, balancing family love in the face of dire circumstances against the pulsating energy of a self-assured young man swaggering through Harlem streets in a fine zoot suit and a conk.... The story of a reckless young man finding himself, X: A Novel is historical fiction at its best —- an artistic exploration of a part of a renowned person's life , one that stays true to his time and place. Powerful and charming—makes you see things in a whole new way. One of the best books I've read in quite some time. The inequality and injustice are vivid in this account, and this helps young adult readers today better understand what African Americans were subject to in the not-so-distant past.... This is a must-read introduction to his life for all youth to fully understand U.S. history during the twentieth century.